Bandit Valley is the second level of World 6 found in Yoshi's New Island. 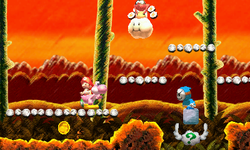 Yoshi starts the level in a cave with some enemies and a pink door which leads to an area with a Mega Kantera and a Tetu Kantera, either of which can be swallowed in order for Yoshi to clear the spike path. A door leads back outside to a Checkpoint Ring and an area with more enemies and a Thunder Lakitu which tracks the Yoshi. Eventually, Yoshi reaches the Goal Ring. The music in this level appears in Super Smash Bros. for Wii U as one of the selectable songs for the Woolly World stage.